"The pens [Crocodile Big Croc Clip and Diamond Cut] arrived last week. I had my mail held at the Post office because I was out of town for a few days. So I have had the pens in my hands only one day. Pure pleasure to hold each one. All three are small and easy for me to hold for writing purposes. The Duke pen is just the right size. The two tone color makes it easy to find among my collection. The nib glides along very the greatest of ease. I am writing letters to people who haven't heard from me in years. 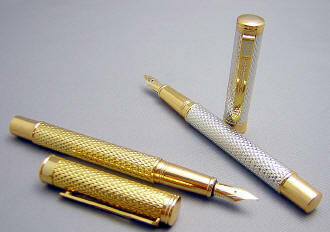 I need reasons to use my pens...Thank you for your web site and the personal care of the products." 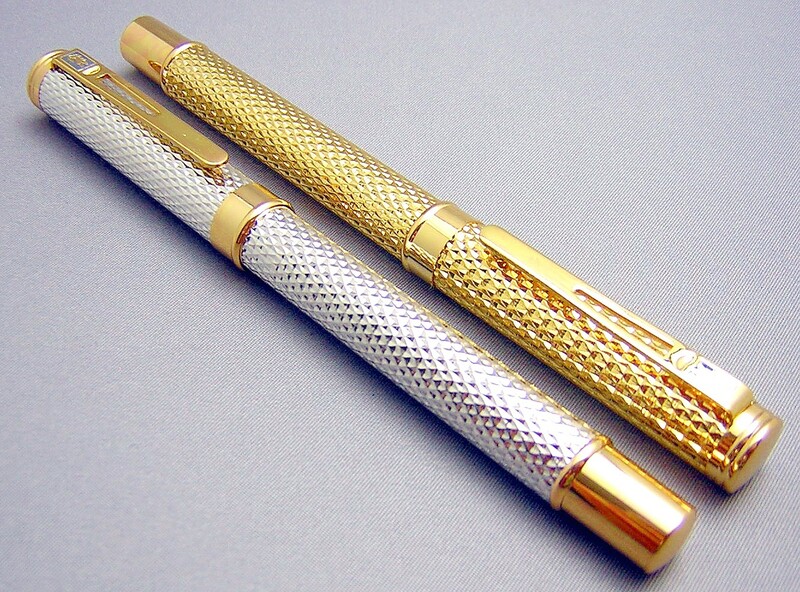 Whether you choose the Silver & Gold or the all-Gold version of this extremely handsome pen, you've got a real 'looker' in your hand! 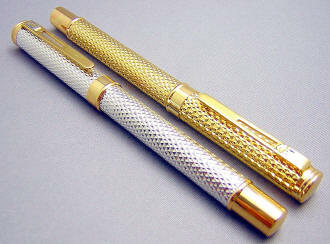 A slim pen, it measures 5-1/4" capped, 6-3/8" posted and 4-5/8" with cap held aside. Although metal, this is not an overly heavy pen, due to it's somewhat slim profile. 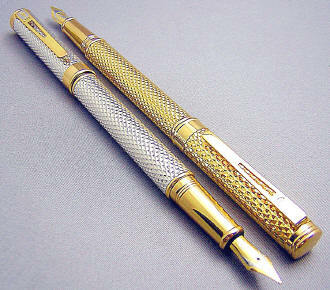 It's well-balanced with its cap posted or not, and allows for extended writing sessions without fatigue. The diamond cut pattern on cap and barrel really makes the pen shimmer in light, and provides a pleasing texture to the pen as well. 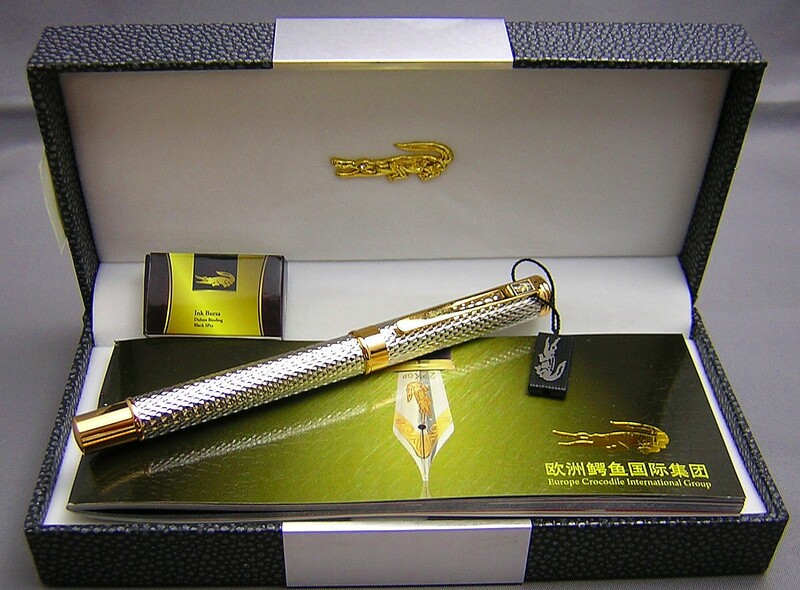 The pen is otherwise unadorned, with the exception of the small crocodile logo at the top of the clip. 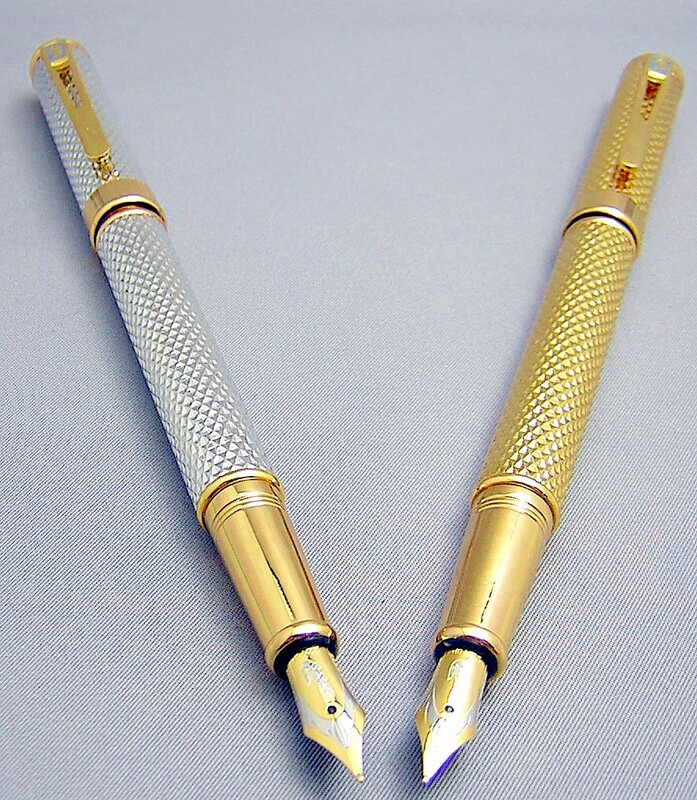 Removing the slip cap reveals the two-toned, 22K gold-plated steel nib, which reprises the Crocodile logo. I would rate the nibs as a light-medium, meaning it lays down a line somewhere between a typical western fine and medium nib. Unscrewing the all-metal threads between the section and barrel displays the piston converter for bottled ink. It contains a coiled metal agitator, to help prevent ink from adhering to the inside walls and thereby starving the nib/feed. It will also take International-style cartridges, such as those from Private Reserve. As with all new pens, I recommend to run a dilute solution of dishwashing soap (two or three drops to a small bowl of water) through a new pen a few times, followed by water only. Step one is effective at removing manufacturing oils that can tend to make the ink less than enthusiastic in heading from the converter/filler to the nib, and step two removes the traces of the detergent you've used...which tends to have the opposite, diuretic effect. A gift box is included.